Shakespeare’s Celebrations is a partnership between Stratford-upon-Avon Town Council http://www.stratford-tc.gov.uk/ and Stratford on Avon District Council https://www.stratford.gov.uk/ who work together with the other organisations to provide the Shakespeare Birthday Celebrations. The principal parade and flag unfurling ceremony, organised by the Town Council and attended by diplomats, notable visitors, local dignitaries, community groups and school children, is the focal point of the celebrations and takes place on the Saturday nearest to his birth date of 23 April. The 2018 celebrations welcome the start of the Community Carnival Parade, once again organised by the Councils. The Shakespeare’s Birthday Celebrations in Stratford-upon-Avon are brought together through the mutual cooperation of a number of key organisations, who are all committed to continuing this tradition. Holy Trinity Church is the principal birthday parade’s destination where people in the parade bring flowers to adorn William Shakespeare’s grave. On Sunday 28 April, participants will process to Holy Trinity Church for the Shakespeare service. This memorable annual service features verse and music from members of the current RSC ensemble, the preaching of the Shakespeare Sermon and includes the receiving of the quill. This will be placed in the hand of the effigy overlooking the poet’s grave, by the Head Girl of King Edward VI School. King Edward VI School in Stratford-upon-Avon is where William Shakespeare received his formal education more than 400 years ago. Each year, since the annual tradition of celebrating the Bard’s birthday began in 1893, the pupils have turned out en masse to participate. Pupil numbers have swollen over time to exceed 800 today, creating a memorable sight as part of the spectacle. Royal Shakespeare Company actors perform extracts from the current season. The Company also host free activities for the whole family, including storytelling sessions, stage-fighting workshops and the chance to discover how fake scars and bruises are created. Visitors are also able to go on theatre tours, enjoy music in the foyer areas and explore the 36-metre high Theatre Tower. Shakespeare Birthplace Trust host special events and activities at the Shakespeare Family Homes over the celebratory weekend. The Shakespeare Birthday Lunch which is hosted and organised by Mr and Mrs Alan Haigh, specifically upholds the tradition of providing a formal luncheon on the day of the Saturday parades. Stratford-upon-Avon College works collaboratively to inspire learners to develop their full potential and generate economic success. Students from the college have played an active part in providing practical support and entertainment. Stratford-upon-Avon Literary Festival is one of the most significant literary festivals in the UK, attracting thousands of people who share one passion: a love of books, writing and reading. As the birthday celebrations draw to a close, so the Stratford-upon-Avon Literary Festival begins in earnest and is staged throughout the following fortnight. 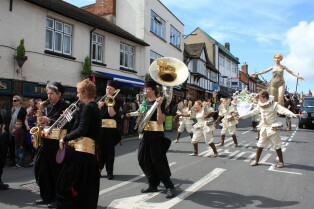 Stratforward BID is the conduit between the event organisers and businesses in the town centre.